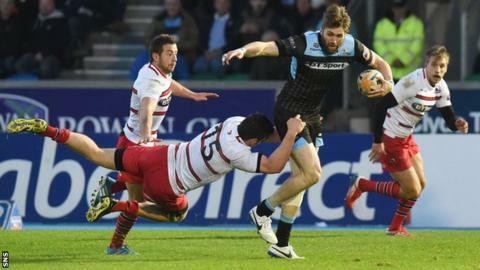 Gregor Townsend admitted his Glasgow Warriors side need to sharpen up in defence after their 37-34 Pro12 victory over Edinburgh. Warriors, who retained the 1872 Cup with the win, are now second in the table and in a great position to secure a home play-off tie. But Townsend was unhappy with how open his side were at the back. "To concede more than 30 points wasn't good enough," said the head coach. "I'm delighted with the win and the 1872 Cup, and the bonus was that fourth try that puts us in a very good position in the league. "But we pride ourselves on having a good defence every time we play, or better than that, an outstanding defence, and it was very porous today. It'll take a good couple of viewings of the game to find out exactly why. "We had our moments where we showed good concentration and intensity but then we slipped off and didn't back up our good bits of play with really good defence. "There was also a couple of things in the system, people not taking the right man, which we'll fix on the training field next week. "At times we played really good rugby but defensively that was probably two or three out of 10. The players put in a huge effort and showed a lot of skill but we're keen to play better." Warriors are now well-placed to get that all-important home play-off tie, but Townsend is taking nothing for granted. "We've got a really tough game up ahead away to Treviso and they've been playing really well at home, so we've got to make sure we get over that game. "If we pick up one bonus point out of the last two games we will get that home semi-final, but our focus will be getting a win in Treviso." Glasgow skipper Al Kellock agreed with his head coach's assessment. "We were really pleased with how we went forward, some of the attacking stuff was top class, but we shouldn't be conceding points like that and finishing games like that," he said. "You have got to credit Edinburgh, though, for the way they kept coming." Edinburgh were 37-20 down with just a few minutes left, but two late tries narrowed the gap. And head coach Alan Solomons was left cursing his side's early slackness, and the yellow cards shown to Izak van der Westhuizen and Mike Coman. "We gave ourselves too much to do. Besides playing for 20 minutes of the 80 with 14 men, our error rate was too high," said Solomons. "But I thought the team showed tremendous character to come back like that. The way we were playing at the end it just made me wish we'd had another five minutes, because we could have sneaked it. "We got two bonus points out of it, so at least that is pretty positive."